This is another book that I read for Bibliophiles Anonymous, but to be honest, I probably would have picked it up anyway. I was a big fan of The DaVinci Code and Angels and Demons, so I was curious what trouble Robert Langdon would get into next. In this case, Langdon wakes up in the hospital, with no idea where he is or what day it is. He has been shot. Suddenly, a woman with spiky hair dressed all in black bursts in, kills one of the doctors, and attempts to finish the job with Langdon. Langdon escapes with the help of a nurse, Sierra, and discovers that he is in Florence, Italy. They discover over the course of the book that there is a man, who goes by the name “The Shade” who is threatening the world with another bubonic plague. He believes that the population is expanding out of control, and that people like the World Health Organization are doing nothing to stop it. This man is also obsessed with Dante’s Inferno and hides clues in the text of that manuscript and in pieces of art inspired by it. Cue Langdon, our faithful art historian and symbologist, who also has more than a passing familiarity with Inferno. The book was good and suspenseful. I have to admit, I didn’t see the ending coming at all. I’m not going to spoil it for you, but let’s just say that it wasn’t a black and white ending. It’s very ambiguous and left me with a very strange feeling. It made me think for a long time after I finished the book. 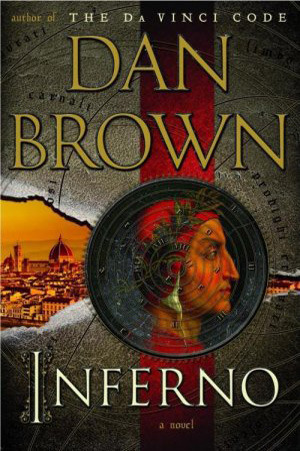 If you’re a fan of Dan Brown, I would say that this isn’t his best work, but it’s certainly a good read. It’s made me want to visit Florence anyway, although I wouldn’t have minded doing that anyway. Today is the last day to vote for the new story feature that will premiere on Monday! Go to this page to vote on who the main character is and the place where the story begins. I will start writing this weekend!